Sometimes the most extraordinary things come from a little push. This was the conversation my friend and I had to go through to motivate ourselves to attend artist, Rachel Gadsden’s live painting exhibit. 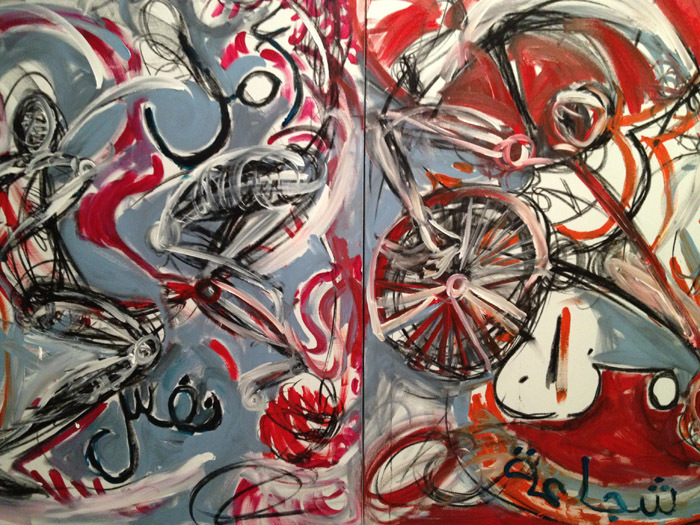 3×3 meter canvases hung on the wall outside the Al Riwaq Gallery. I found an empty seat next to my friend, artist Lena Dajani and settled in to watch the show. I admired her courage. First, painting in front of a group must be a bit like speech making; one of the top ten things people dislike doing. Secondly, she did not know how much effort it took to motivate the self-conscious, mostly young, female audience, wearing hijab to trade their phones for a paint brush. I grabbed a tissue from the passing waitress and got busy munching the chicken avocado sandwish. I encouraged my young, thirteen-year old friend to get up and paint. She suddenly discovered the chocolate cake and busied her hands. Eventually a couple of European ladies got up and painted. As I watched the combination of grey-blue, orange, red and teal cover the canvas, I wondered how the artist would pull it all together. Two of the four canvases completed, Rachel started on the third canvas. The young girls around me would not go up. Finally, I could not wait any longer. I grabbed a paint brush and started painting curves and circles. As I painted, Rachel Gadsden explained to the audience how honored she felt when Prince Charles and the Duchess of Cornwall had been at the opening of her exhibit “This Breathing World” at Katara Cultural Village for the Arts and Disability Festival in Doha. I barely heard her. It was so FUN painting without fear, free from any worry what the end result would look like. I let the color move itself across the canvas. I could have continued longer, but felt obliged to share the joy and sat down. “I do not know what word to write,” they claimed. I held the charcoal and she guided me through moon. As soon as the word was done, she left me to color it in. By the time I relinquished the palette, the paintings were nearly complete. Returning to my chair, I encouraged my young friend to add a word before the session ended. She began consulting the Bahraini girls. Purses were opened, pens were located, and finally a scratch paper was torn from the memo pad. Thanking the young women, she rushed to the canvas and wrote her word across the bottom. “What did you write?” asked Rachel. “Courage” she smiled, her braces showing. That’s what Art does. It gives us courage to engage our neighbors, linking us together despite the differences in culture and abilities. And it only takes the vision of one person, someone like Rachel Gadsden, to motivate us to find shared beauty within the multi-colored mess of our world. Contemporary artist, Rachel Gadsden, is the Director of Unlimited Global Alchemy. Her exhibit This Breathing World is about experiencing disabling conditions and fighting for life in the face of social taboos. It includes drawings, paintings and films, and is underpinned by themes of fragility and resilience, a shared and positive sense of survival in the face of chronic health conditions, and the politics and mythologies surrounding disability. Unlimited Global Alchemy was one of the thirteen commissions awarded during the second round for Unlimited is the ground-breaking programme that celebrates arts and culture by disabled and deaf artists. Funded by the Olympic Lottery Distributor, 820,000 pounds was granted to artists for the London 2012 Cultural Olympiad. Unlimited Global Alchemy is one of three commissions in round two who created in collaboration with international partners and with funding contributed by the British Council. Unlimited is delivered in partnership between London 2012, Arts Council England, the Scottish Arts Council, Arts Council of Wales, Arts Council of Northern Ireland and the British Council. You can see her photos, which are much better than mine, on her tumblr account and learn more about her on her website. 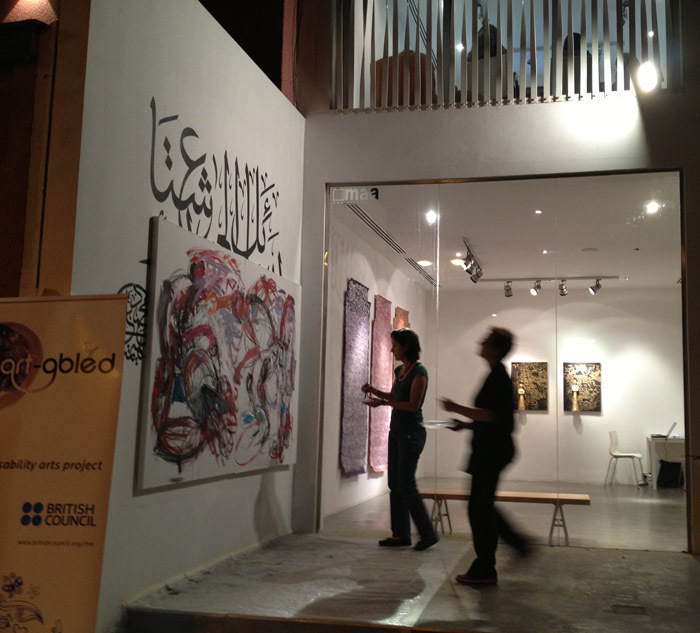 The British Council sponsors artists who come to Bahrain and offers free classes to anyone who wants to sign up. Meant to help encourage art within the local community, my experience is I show up and usually there is an open seat. I take one and suddenly meet the most extraordinary people. Rachel Gadsden’s visit is being sponsored by the British Council and the Al Riwaq Gallery. I’m so glad we attended this event! The weather was beautiful and the artist inspiring. I was fascinated by how Rachel moved around the canvas! It was as if she were an athlete preparing for a high jump; but rather than jump, her arms swirled up and down and with charcoal in hand she added fluid strokes to the painting. The end result was truly dynamic! I love that you got up to participate! That is hard to do in these situations. But at the same time, it is what the artist needs from you. Love the art….AND the words you chose to write! It was one of the moments that just happen and everything comes together so wonderfully. Wish I’d been there. It sounds wonderful!! “‘Courage’ through the braces” brought me to tears. What a wonderful serendipitous experience. Which is the essence of “live painting” to be sure. So glad you participated and were able to share – thanks for the vicarious experience! Thank you so much for this wonderful blog, it is so good to receive feed back about an live painting event. For me these occasions are all about the people who are there and not me, and without the support of the audience the magic is not there. So I extend my thanks to everyone who helped to make this evening truly memorable. The good news is that I will be returning to Bahrain and I hope to meet you all again soon so that we can extend these artistic relationship further. Please keep in touch at rachelgadsden@blueyonder.co.uk and if any of you are visiting London let me know as I will invite you to my studio there.